Do you ever have days when minor problems become crises or anxiety saps your happiness? The psalmists did---and Swindoll shares their secrets to living a victorious life in the midst of the daily grind! Combining practical illustrations with inspiring insights, his updated 26-week study will help you deal with discouragement, worry, God's apparent silence, and more. 308 pages, hardcover from Worthy. What the Bible Really Says about Prayer Countless books have been written about prayer, how to pray, and when to pray. This book includes exactly what God says about prayer, straight from his Word. It is organized by subject, such as prayer in the Old Testament, types of prayer, prayers of the psalmists, and prayers of Jesus. All the scriptural prayers and primary references to prayer are collected in this clear, concise book, with enough explanation to help even those new to the Bible. Its length and focus make it perfect for readers who love the Word of God. Teach your kids how to manage money wisely---and learn how to protect them from the pitfalls of easy credit, an attitude of entitlement, and a chummy relationship with debt. Sharing proven principles and her own hard-won experience, finance expert Hunt also shows you how to give your kids expanding financial responsibilities during each stage of childhood. 224 pages, softcover from Revell. Today's Generation iY (teens brought up with the Internet) and Homelanders (children born after 9/11) are overexposed to information at an earlier age than ever and paradoxically are underexposed to meaningful relationships and real-life experiences. Artificial Maturity addresses the problem of what to do when parents and teachers mistake children's superficial knowledge for real maturity. The book is filled with practical steps that adults can take to furnish the experiences kids need to balance their abilities with authentic maturity. Artificial Maturity gives parents, teachers, and others who work with youth a manual for understanding and practicing the leadership kids so desperately need to mature in a healthy fashion. Levi Benkert was playing with his children in the park when he received an urgent phone call from a friend asking him to drop everything and fly to Ethiopia to help organize a rescue orphanage for children destined to be murdered as part of a tribal superstition known as “mingi killings.” Moved by his friend’s story, Levi packed his bags and left for what he thought would be a short two-week trip. But upon meeting the children, Levi knew there was no turning back. Six weeks later, Levi, his wife, Jessie, and their three young children sold their home and all their belongings and relocated to Ethiopia indefinitely. No Greater Love documents Levi’s journey—from the challenges he faced establishing and running the orphanage to finding adoptive homes for the children. Do you believe that there must be more to life than eating, sleeping, and working? You're right! Calling you to leave behind the mundane and the meaningless, Merrick challenges you to join God's grand purpose---to restore, redeem, and renew the world through Jesus. Discover how to continue Christ's redemption story right where you are! 224 pages, softcover from Cook. A fresh worship experience from four up-and-coming voices whose heart's desire is that you'll encounter God and his love! Ten songs feature Derek Johnson, Mary Kat Ehrenzlier, Nate Ward, and Justin Jarvis on "Be My Love," "Here We Are," "I Belong to You," "I Won't Settle," "Mighty Fortress," "You Are My God," and more. Celebrating Integrity Music's landmark 25th anniversary, 25 Songs That Changed The Way We Worship gathers genre-defining Worship moments from artists like Paul Baloche, Darlene Zschech, Robin Mark, Kari Jobe, and others. Includes two CDs and a bonus DVD featuring 17 powerful videos, spotlighting the life-changing anthems that have helped shape the sound of worship for the last 25 years. Reveal if you re the real deal. Discover what your room says about you. Find out if you re a follower... or a leader! Hey, Girl. This book is all about YOU! Knowing all about YOU is super important but don t worry, we ve got your back! 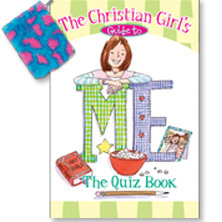 The quizzes in The Christian Girl's Guide to Me: The Quiz Book are jam packed with all kinds of advice to help you discover who you are and who you are meant to be. Learn how you can make more friends, how to get closer to your family, and how to let God do totally amazing works through you! So grab your favorite pen and get ready to meet your new best friend: YOU! 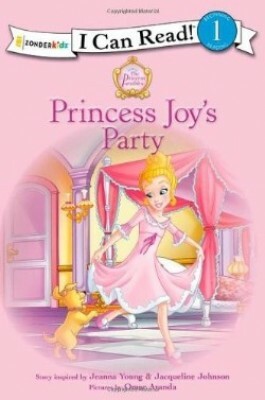 In this level one I Can Read, Princess Joy's Birthday Blessing, Jesus' lesson about who is best to invite to your home comes alive for little princesses just learning to read! When no one accepts the invitation to Princess Joy's birthday party, she is sad. But her father, the king, helps her to understand that there are more ways to celebrate a special day and much better gifts to get than ones wrapped in pretty paper and bows. Backed by more than four decades of counseling experience, Dobson provides a quick-access collection of advice on nurturing your marriage and children with love, grace, and biblical preparedness. Topics include boundaries, communication, discipline, divorce, forgiveness, health and safety, money, single parenting, self-esteem and self-respect, stress, and much more. Includes a new introduction from Dr. Dobson. Singles from Paige's debut album, Wake Up, have appeared on Top 30 charts of Christian music, and extensive media coverage, including an appearance on the Today Show, has earned her a legion of fans. With a growing reach, Paige will connect with readers and help them understand that it's time to wake up! After fleeing North Dakota and the now defunct Wild West Show, Cassie Lockwood and her companions have finally found the hidden valley in South Dakota where her father had dreamed of putting down roots. But to her dismay, she discovers a ranch already built on her land. Cassie's arrival surprises Mavis Engstrom and forces her to reveal secrets she's kept hidden for years. Her son Ransom is suspicious of Cassie and questions the validity of her claim to the valley. But Lucas Engstrom decides from the start that he is in love with her and wants to marry her. When Trey Caldwell's dad is killed in Afghanistan, his death leaves a hole in the 12-year-old's heart---and an unfinished soap box derby car in the garage. But then he meets fire chief Roy Gibbs, who lost his firefighter son on 9/11. Can the two wounded souls rebuild their lives as they assemble the car? Dove approved. 108 minutes. *Features Derby Downs, home of the Soap Box Derby in Akron, Ohio. Are you sometimes confused by which miracles to believe? Award-winning Christianity Today journalist Stafford takes a careful look at unexplained events in our modern world---some hard to accept and others hard to deny---and places them in historical and biblical context. He then explores questions about what role they might play in your life. 240 pages, softcover from Bethany. Live Life Right Here Right Now! Many people spend a majority of their time living either in the past or in the future. Those who live in the past are often filled with regret, replaying again and again decisions that might have led to a better today. Those who live in the future often forget that it’s the decisions they make today that will shape tomorrow. In this inspirational title, Carole Lewis challenges readers to treasure today and make it the very best day of their lives! Live Life Right Here, Right Now shows readers how to become the person they’ve always wanted to be by living into the joys and trials that today brings along. Carole’s message is simple: We cannot change the past, but making today count will have a profound effect on our future. Walk with Ruth as she journeys to Bethlehem, certain of her calling, yet uncertain of her future with her mother-in-law. Bringing this rags-to-riches story alive with her novel approach to Bible study, Higgs helps you see how God works to redeem each loss and disappointment in Ruth and Naomi's lives - and yours! 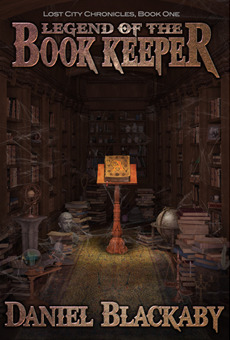 Includes discussion quesitons and a study guide. Most women feel torn, to greater and lesser degrees, between what the voice of culture tells them to be and what it means to be a woman created and defined by God. Marvelously Made invites women to discover the truth about who they are and experience the deep contentment that comes with living into and out of the Creator’s design. Readers will dig into Genesis 1–3 and Psalm 139 to find out God’s intention for women and shift their perspective from Who am I? to Who is God?, the key to unmasking the identity the Creator has in store for every unique, one-of-a-kind woman. Marc Royce stares down from the helicopter on the Rift Valley slashing across Africa like a scar. Tribal feuds, drought, and dislocation have left their devastation. And he sees a new wound--a once-dormant volcano oozing molten lava across the dry landscape-and clouds of ash obscure his vision. His undercover assignment is similarly obscured. Supposedly dispatched to audit a relief organization's accounts, Marc finds himself amid the squalor and chaos of Kenyan refugee camps caught in a stranglehold of corruption and ruthlessness. But his true task relates to the area's reserves of once-obscure metals now indispensible to high-tech industry. The value of this rare earth inflames tensions on the world's stage as well as among warring tribes. When an Israeli medical administrator, Kitra, seeks Marc's help with her humanitarian efforts, they forge an unexpected link between impoverished African villages and another Silicon Valley rising in the Israeli desert. Precious metals and inventive minds promise new opportunities for prosperity, secure futures, and protection of valuable commodities from terrorists. As Marc prepares to report back to Washington, he seizes a chance to restore justice to this troubled land. This time, he may have gone too far. Navigating the decade of the 20s and beyond can be tricky. Most women are making life-shaping decisions during these crucial years—but how can they know the choices they make now won’t mess up the rest of their lives? How can they use this time to lay a foundation that is strong enough to support their long-term dreams? Survival Guide for Young Women is the essential guide for Christian women who long for a lifetime of spiritual meaning and personal fulfillment. Holly Wagner and her 20-something friend Nicole Reyes help readers discover who they are and why they are here. Packed with relatable illustrations and practical tips, this handbook for life will challenge young women to make the most of every minute of their 20s . . . and beyond. From September to June, your students' calendars are filled with homework, exams, football games, play rehearsals, concerts, and more. Remind them to slow down and focus on their daily faith walk with this school-year devotional. Filled with brief inspirational thoughts, quotations, and prayers, it will encourage young hearts in the things that matter most! 208 pages, softcover from Abingdon. A City Long Lost - Ready to Be Found. How did the U.S. become the freest, most prosperous country in the world? Kirk Cameron challenges you to discover America's true "national treasures"---the people, places, and principles that have empowered this nation. Beginning in England and moving forward, you'll learn about the founders' motivations, designs, and goals and how to apply the same truths today. (PG.) Approx. 90 minutes. Parents---discover a "bored-no-more" guide to having faith conversations with your kids! Each of these 52 zero-prep devotions features an icebreaker, Bible exploration, discussion prompt, and real-life application. Whether used around the dinner table, during family activities, or just before bedtime, this practical, imaginative resource will challenge and encourage your family toward lasting spiritual growth---together. 192 pages, softcover from Baker. There's nothing quite like the warmth and relaxation of the beach-away from the stresses of the world and into a place of peace and refreshment. Devotions for the Beach is the gentle breeze that takes you there, to see the majesty of God and to open your heart and soul to the One who created it all. These ninety devotions explore the parallels of life with the elements of the shore to help you see God, to find hope, to draw strength, and to rest in the comfort of His arms throughout your day. Included are striking photographs with a fresh, contemporary design for timeless appeal. Historic preservationist Libby Holladay ironically knows nothing about her own history. That is, until her friend uncovers information on a remote island in the Outer Banks---and then disappears! With the help of Coast Guard captain Kirk, can Libby find Nicole and unearth clues about her extended family before it's too late? Kara McKormick is auditioning for a new teen TV show! She loves the screen test process---but has no idea it's a "character" test as well. Will the spunky New Yorker meet the standards of co-star Chad Beacon's parents? And when tragedy strikes, will Kara choose her family over her career? Includes reading group guide. 320 pages, softcover from Nelson. Flying to coordinates unknown, the Wikk kids land the Phoenix on planet Evad and descend into an ancient jungle. Revealed is a highly intelligent civilization, once inhabitants, but now vanished, leaving behind astonishing technology! High stakes lead the Wikk kids on a dizzying ride from the pinnacle of a ziggurat into an endless underwater labyrinth. Dive into adventure, as the twins face a deadly showdown with the evil Ubel! Can they win the struggle to survive the savage snares, with the help of the elusive, Brother Sam? The Quest for Truth series follows the four Wikk kids in their desperate race to find the mysterious planet Ursprung and stop the Ubel renegades from misusing its long-lost secrets. Ancient cities, treacherous villains, high-tech gadgets, the Phoenix -- encounter all these and more on this futuristic, interplanetary adventure.